In this Individual event placing on the leaderboard will grant you access to a special chest: The Statue Chest. 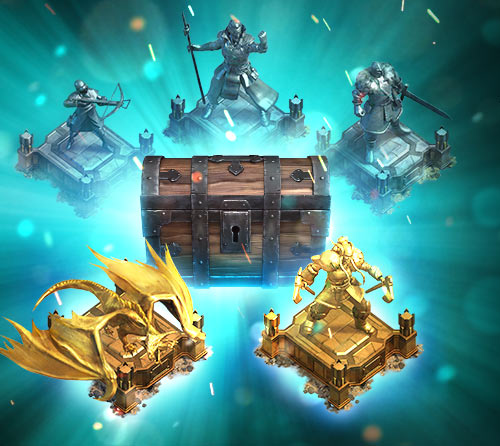 This rare and mysterious container will provide another chance to win a Statue, including Sulric’s and Malice’s or the brand new Birna statue! Earn more Battle Points by using the boosters below. Having a place on the leaderboard will be your ticket to a chance at one of the statues! The statues in each of these chests match their rarity, therefore a Gold Statue Chest will provide a Gold Statue, so making sure you place on the top is vital to obtain the best possible statue! Birna - Gives defences a health boost! NEW! Malice - Gives defences a chance of cursing targets to raise as an Undead Warrior! Sulric - Gives Spell Towers an increase in their defence damage! Soldier - Increases your physical defense damage! Warden - Allows the Watchtower to deal more damage and increases its health! Don’t forget! - A statue’s effects are only granted when placed on a plinth.